Wedding and Portrait Photographer - Fun Photo Booth Hire in Bradford, Leeds and Yorkshire. Hire a fun photo booth for your wedding reception. 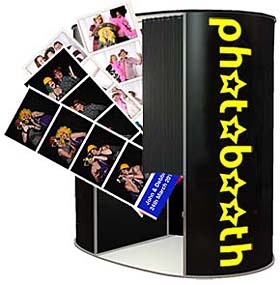 Photo booth’s are great fun at Weddings and parties providing you and your guests a lasting memento. A fun Prop box is included with your photo booth hire containing hats, masks, feather bowers, wigs, funky glasses ect. The prop box can be themed to any event if requested. Our photo booths can be supplied in a colour to match your wedding theme. Our fun photo booth provides unlimited instant prints and video messages using a high quality camera, professional lighting, a touch screen monitor and a box of props including hats, moustaches, wigs, inflatable guitars and much, much more. Contact me today to book your fun photo booth. Travel charges may apply to bookings more than 50 miles from Leeds.